The Fast, Secure and Free Way to Switch Your Automatic Payments & Direct Deposits. 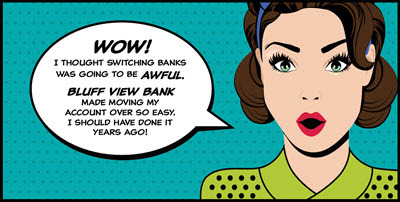 Switching your direct deposits and automatic payments to Bluff View Bank doesn’t need to be a hassle. We’ve made it easier than ever with ClickSWITCH. In as little as 10 minutes, switch all of your direct deposits and automatic payments to your new or existing account at Bluff View Bank. This eliminates the hassle of having to contact each business and helps to ensure that you don’t miss a payment during your account transition. To get started, call Bluff View Bank or stop in to any branch today to receive your activation code. Login to ClickSWITCH and in a few simple clicks, you’ll activate this secure online solution. Use your old account to automatically find and move all recurring transactions.